Yes, that featured image is me posing with a cardboard cutout of Steph Curry. And before you ask, yes, he is mine, he lives in my dorm room, and he was a Christmas present. I swear, though, I’m not that weird–I just take my dedication to ironic comedy a little too seriously and also just realllllllly like the Golden State Warriors, but I think you’ve all picked up on that already. As I explained to you all in my presentation two weeks ago, social media was a large player in the formation of my obsession with the Warriors. But it’s not just their social media that makes the franchise a standout–it’s their entire digital media and marketing strategy. Though I intend to talk at length about the Warriors’ social media strategies and successes, I’m focusing this post on the use of digital engagement within the arena, and in curation of #DubNation. The Warriors have made social and digital engagement a priority; they’ve hired Silicon Valley gurus, young social media experts, and have restructured their organization to put an emphasis on real time engagement and analytics. installed throughout Oracle Arena (the Warriors’ home court, affectionately referred to as ‘Roaracle’) that links to fans’ phones that are within range to display promotional messages, offer discounts for shops the fans are near, and even send fans a video message from a team member welcoming fans to the arena through the Warriors app. The sensors also help create data of the most frequently visited locations within the arena. Another crowd favorite is the instagram wall, which features a rotational display of instagram posts from fans using the Oracle Arena geotag or the #WarriorsGround hashtag. The team was even the first in the league to introduce app functionalities for Google Glass, which allows fans to watch the game while simultaneously referencing game and player stats. Vice President of Digital and Marketing, Kenny Lauer, has continuously spoken of the importance of data and digital in engaging fans, and takes pride in the franchise’s ability to take risks when it comes to data & tech. What allows them to take these risks, he says, is not just the Silicon Valley mindset, but the use of the franchise’s D-League team, the Santa Cruz Warriors, as test subjects for bigger campaigns for Oracle. Anyone who paid attention to the NBA finals in the past two years has seen the Strength in Numbers campaign–it’s been plastered onto every billboard and tee shirt, and hashtagged in every tweet and instagram since the fan-made mantra was adopted by the Warriors during the 2014-2015 season. In basketball, Strength in Numbers refers to the idea of a team that doesn’t just have a few superstars that carry the team, but relies on each individual team member for an impactful contribution. Through incorporating the slogan into YouTube specials, short video campaigns, and media posts, it’s been leveraged to represent the Warriors brand as a whole–inclusive, egalitarian, and a community in which the sum is greater than its individual parts. It’s a motto they’ve embraced both on and off the court, as the franchise actively seeks to engage their entire fan base and continuously emphasizes the importance of fans’ voices and contributions to the Warriors franchise. The mantra is symbolic of the Warriors’ dedication to creating a fan experience, beyond just 48 minutes. 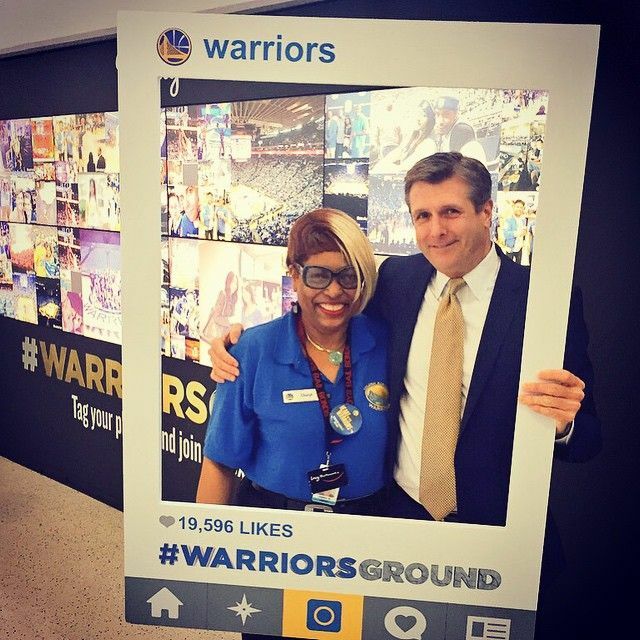 Part of the #StrengthinNumbers campaign has even been an online photo editing app which allows fans to upload photos of themselves and add the tally marks (featured in the “M” of ‘numbers’ & representative of the franchise’s 5 NBA titles) to represent the fan’s individual tie to the team, which are then featured at various home games as an interactive way to again showcase the importance of the Warriors’ fanbase. They’ve also leveraged the campaign to push the Warriors Community Foundation agenda, which aims to perform various community service acts throughout the Bay Area and has been largely successful over the past few years. It’s an incredible example of how the Warriors have been able to seamlessly unite their on and off court efforts, creating a brand and a community fans can identify with, even in the off season. Great post & great presentation. I happen to share your GSW enthusiasm and was interested to see how the importance of the Warriors Fan Base is definitely highlighted through Golden State’s digital strategy. The sensors installed in the stadium remind me of the Swag’r platform that uses geolocation technology to target offers based on where people are. Also, the way in which the NBA is adopting new technologies that have transformed the fan experience is further evidenced by Steph Curry’s platform he co-founded called Slyce — a social media publishing and tracking platform for brands and influencers. Have you done much digging into this? I’ve followed Slyce a little bit because I’ve seen Steph promote it so much, but from what I can tell the app hasn’t been super successful. It seems like it’s supposed to be an exclusive platform for influencers/brands to connect with fans, but they’re already doing that on twitter, instagram, etc. so switching costs have been pretty high. I’m interested to see how the app continues to progress and innovate to get around this problem! Really neat post! I’m not much of a big sports fan so a lot of this information is totally new to me. Stadium apps seem like a great idea in that they can be fun for visitors but they also provide valuable analytics to those managing the complex. Your post makes me think that TD Garden could do a lot more – they have hashtag contests to get featured up on the Jumbotron in between hockey periods, but that’s sort of it (at least what I can remember). It’s really neat seeing that the Warriors are finding great success both on and off the court! Great follow-up post to your outstanding presentation! This definitely added value to your already eye-opening presentation. I think sports offer a great platform to open up these products, campaigns, etc. because it is a community where people rally together. I just saw the NFL’s video of “kiss cam” promoting diversity, and this can kind of relate to the strength in numbers campaign because its about tying people together and in supporting a common goal like a team, we can all support each other. 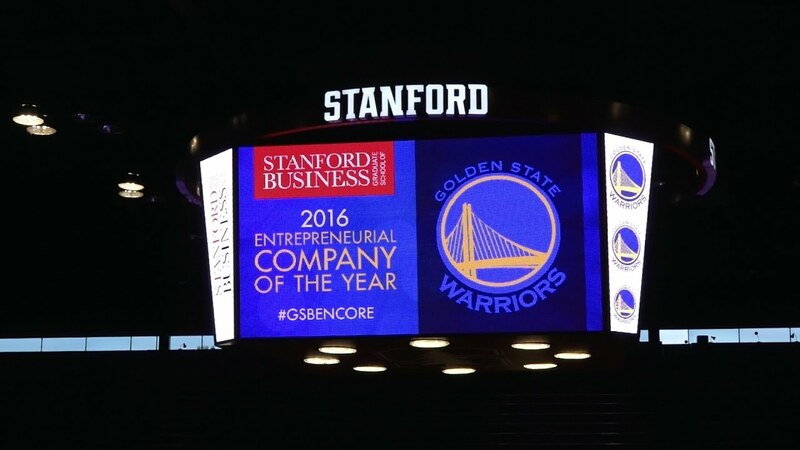 I keep learning more and more about the NBA and social media!I think the most interesting part of your blog for me was the piece about them winning the 2016 Stanford Entrepreneurial Company of the Year (ENCORE) Award and that they are hiring what would be Silivon Valley “gurus” to run their pages. Does this mean there is a whole new industry in sports and social media. Will other teams be competing with the top companies for employees? Honestly, I think yes. Many of the top executives at the Warriors are also successful venture capitalists or execs poached from other top Silicon Valley companies. Though it’s definitely more prevalent in the Warriors organization due to their location, the trend has begun to spread throughout other franchises– the current owner of the Memphis Grizzlies is also the CEO of a young Silicon Valley wireless internet company, and many other owners/execs are investing in startups and tech companies. Such a great follow-up to your presentation! I love that you were able to go really in-depth about the Warriors’ strategy. The coolest part to me is how they are able to engage both far-away fans and people at the games–sometimes using the same strategy. The Strength in Numbers campaign is brilliant, since people love sick edits of their pictures and are proud of how long they’ve been fans. To engage fans at home with this campaign, and then feature some on the big screen during games, is such an engaging idea. The format of those pictures reminds of the Straight Outta Somewhere campaign, where their personalized photo generator went viral. I’m curious if we’ll see more engagement-focused, customizable campaigns like that in the future. It seems like a great way to make the customers feel like they’re a part of the movement. Everyone that’s commented above me has really hit the nail on the head. I really enjoyed your presentation and this was a more in depth analysis that I found really interesting as well. I had no idea that any team in sports was using something like “Roaracle” and I think in this day & age, it only enhances the overall fan experience. The Warriors are definitely doing something right, on the court and off the court. I’ve never been to a basketball game myself but I feel that things like “Roaracle” and other high-end technologies are incentivizing fans to keep coming back for more games, thus growing the fanbase. I’d be curious to see if there’s any correlation with their attendance data and when they started implementing these arena technologies but it may coincide with when Steph Curry shot onto the scene. Overall, great insights on the Valley of sports teams!